Regulation that occurs at the transcriptional level involves proteins that bind to DNA and either enhance or repress transcription. This form of regulation controls the amount of a protein that’s made. DNA-binding proteins, as their name suggests, are proteins that interact with DNA. There are two kinds of DNA-binding proteins: those that are sequence specific and those that are nonspecific. An example of a nonspecific DNA-binding protein is the histone than interacts with all the DNA in the cell in the same way. Sequence-specific DNA-binding proteins bind when they recognize a short region of the DNA sequence. Histones interact with negatively charged DNA because they’re very positively charged themselves. The association between the two neutralizes the charge on both and allows DNA to be compacted more than it if the negative charges were repelling each other. Negative control of gene expression uses a repressor protein that, when active, binds to DNA and turns off expression of the gene. For some genes, the repressor is inactive until a co-repressor molecule is present. The corepressor binds to the repressor, activating it and causing expression of that gene to be turned off (see the arginine [arg] example). For other genes, the repressor is naturally bound to the gene to keep its expression turned off until an inducer molecule is present that binds to the repressor and inactivates it, which turns on transcription of that gene (see the lactose [lac] example). The process of transcription and translation of a gene is called the expression of that gene. Positive control of gene expression involves a DNA-binding protein called an activator that binds to DNA and activates transcription. Activators usually need to first bind an inducer molecule that then allows them to bind DNA. When all three are bound, RNA polymerase can attach and begin transcribing the gene. 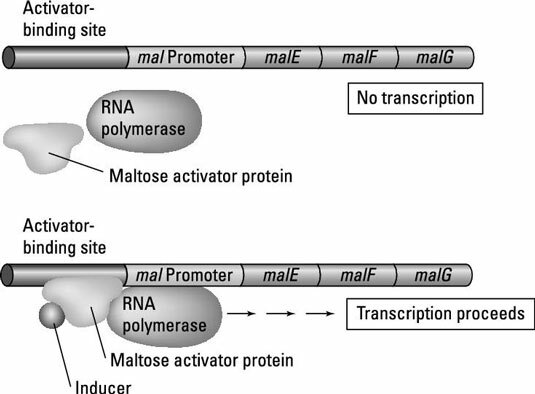 An example of this is expression of the genes for breaking down maltose (a sugar) that require maltose to bind the activator, which then turns on the genes for maltose breakdown. In eukaryotes, regulation of gene expression doesn’t involve repressor or activator proteins. Instead, signals to turn on and off transcription are sent directly to parts of the RNA polymerase enzyme itself.